Trogir-Apartments.co.uk offers you the largest list of private accommodations in Vinisce available on the internet, a rich photogallery and much more. Find apartments, villas with pool, studio-apartments, from cheap rooms to luxury apartment with no reservation cost. Check out guest reviews and ratings, and have a best vacation in Vinisce. Apartments Mastrinka town of Vinisce price per day from € 60 Featuring a patio with Barbecue amenities, Apartments Mastrinka presents self-catering apartments in Vinišće, a 2-minute walk from the seafront. Free internet access access is available throughout the property. Each air-cooled apartment is fitted with a satellite lcd tv and a kitchen with an oven and a microwave. The private toilet comes with a shower. Split Flight terminal is a 30-minute drive from Mastrinka Apartments. Holiday apartment, close to the beach, Vinisce town of Vinisce Gorgeous apartment is situated directly by the water in a tranquil and quiet resort of Vinisce, near Trogir, and can accommodate 4 persons comfortably. General details: barbecue, parking. Entertainment and Sport: TV, Satellite television. Luxury accommodation Vinisce, max 5 persons, recommended by travellers ! town of Vinisce Book apartment in extravagant apartment in Vinisce for exclusive holidays in Croatia. Apartment is modern and beautifully decorated for luxurious vacation in one of the most popular summer spots on the Croatian coast. Distance to the beach: 10m. Distance to the restaurant: 150m. Entertainment and Outdoor activities: TV, Satellite television. Luxury accommodation, 85 square meters, close to the beach town of Vinisce This holiday apartment is not only in the center of Vinisce, but is also very close to the beach so that you and your family can enjoy in summer fun on the purest shores of Croatia. General details: terrace, balcony, barbecue, parking. Entertainment and Sport: TV, Satellite television. Apartments Selina town of Vinisce Set by the beach in the tiny fishing settlement of Vinišće, Apartments Selina has air-cooled accommodation units with free internet access and a balcony providing breathtaking sea views. Free car parking is available on site, and you can shop for groceries just 50 metres away. Each apartment includes a kitchen with dining table, satellite television, DVD player and a toilet with bath. Grill grill can be used in the back yard. A boat harbour is only 50 metres away, and visitors of the Selina advantage from a free boat berth in the sea near the property. The local bus stop is 100 metres from the Selina Apartments. Peaceful accommodation, with terrace town of Vinisce price per day from £ 120 The villa has a lovely and large terrace where you can enjoy sipping your morning espresso. Entertainment and Outdoor activities: TV, Satellite television. Distance to the train: 47 km. Distance to the ferryboat: 47 km. Distance to the beach: 1.5 km. Air-conditioned accommodation, max 10 persons town of Vinisce This holiday accommodation in Vinisce is roomy and modern, and the rooms are nicely equipped, with all the equipments. The villa is surrounded by a Mediterranean garden with a barbecue. Book summer villa for family holidays in Croatia. Entertainment and Outdoor activities: TV, Satellite television. Distance to the ferryboat: 40km. Distance to the beach: 100m. Distance to the bar: 4km. Distance to the restaurant: 4km. Peaceful accommodation, close to the beach, Vinisce town of Vinisce For an awesome holiday with family or pals on the sea shore, go for this family villa, founded in the tourist center of Vinisce in close proximity to Trogir. The spacious villa is equipped with all the services necessary for a pleasant holiday break, including air conditioning and private parking. Entertainment and Sport: TV, Satellite television. General details: air conditioner, heating, hair dryer, terrace, balcony, barbecue, parking. Air-conditioned accommodation, with pool town of Vinisce Completely furnished interiors located on the great location are just one of the reasons why you should book this quality villa in Vinisce. General details: air conditioner, terrace, balcony, barbecue, parking. Entertainment and Sport: TV, Satellite television. Luxury accommodation, with pool, Vinisce town of Vinisce The accommodation is thoroughly equipped with everything to make your vacation pleasurable. Entertainment and Sport: kayak, canoe, TV, Satellite television. General details: air conditioner, heating, private chef, hair dryer, garden, terrace, balcony, barbecue, parking, garage. Apartments Hope town of Vinisce Providing a swimming pool and views of the sea, Apartments Hope is positioned in Vinišće. The accommodation is air conditioned and presents a seating area. A lcd tv with satellite channels and DVD player are available in some units. Mountain bike rent is available at the property and the area is famous for scuba diving. Guest house in Vinišće town of Vinisce price per day from € 49 Situated in Vinišće in the Split-Dalmatia County Region, this detached holiday house presents a back yard with a year-round swimming pool and a grill. Gratis wireless internet is featured throughout the property and free car parking is available on site. An oven and a microwave can be found in the kitchen. Towels and bed linen are offered in this holiday home. 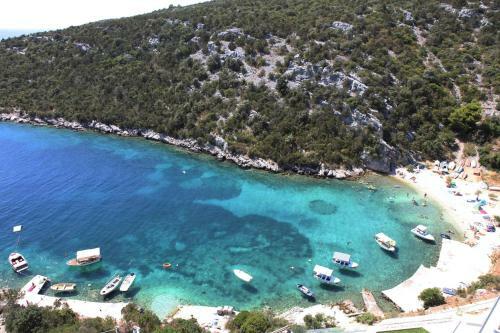 Split is 28 km from Holiday Home in Vinišće, while Hvar is 46 km from the property. Trogir-Apartments.co.uk brings you online bookings at the best selection of hotels and apartments in Vinisce. With numerous beaches, quality accommodation offer, Vinisce is the best place for peaceful summer vacation in Croatia. Plan your holidays in Vinisce, Croatia with Trogir-Apartments.co.uk portal. We are the ones who provide cheap Vinisce accommodation. Vinisce, Croatia is a small fisherman village located only 12 km from the ancient town of Trogir. Inhabitants of this picturesque Dalmatian village traditionally live off of fishing and agriculture. Vinisce and surrounding bays are well-known for their magnificent pebble and sandy beaches, particularly suitable for those who come here on holiday with small children. Vinisce has a small ACI marine, few restaurants, great beaches and a short drive can get you to the city of Trogir, Split or Primosten. Vinisce is great for a quiet holiday in private apartments, rooms, and villas overlooking the Adriatic sea, minutes from the beach. The coastline near the Vinisce is famous for its underwater world, which can be interesting for scuba divers and underwater fishing. If you are looking for a holiday apartment or a house for spending your summer vacation in Vinisce, Croatia you have come to the right address. Find holiday accommodation in Vinisce from our holiday rentals website and book directly with private advertisers.